Trying to protect their accounts from malicious users, Internet users themselves often forget their clever passwords of accounts. If you happened to such trouble, and you can't remember the password to log into a mailbox on "Rambler", access will have to be restored. Click on the link "Forgot password"located on the login page of the account http://mail.rambler.ru/ or http://www.rambler.ru/. In the form fields on the opened page, enter the address of the mailbox which you want to restore. Be careful: the address should be entered completely, with the indication of the domain name and the @sign. 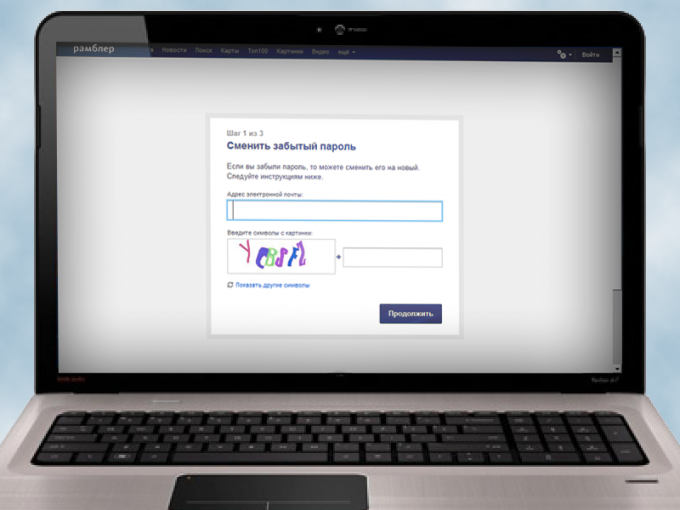 Enter the verification Captcha code shown on the page. If you can't read code symbols, click on the following link to change the display. After you enter all the symbols, click on the "Continue"button. Type in the designated field in the form, the correct answer to the security question that you set when registering the mailbox. Click on the "Continue" button. If the answer does not come, try again. Be careful: the answer should be entered in exact accordance with the way it was entered during registration, including case-sensitive. Enter in the fields on the opened page, a new password to your mailbox, and from the start page to login to your account in the usual way. If the answer to the security question you indicate failed, contact technical support "Rambler". Go to the page http://help.rambler.ru/feedback.html?s=mail and describe your issue in the feedback form. Please note: you will need to provide a valid email address to which you have access, otherwise you will not be able to get an answer to his appeal. If an alternate e-mail you do not, you will be able to create in the postal service Rambler, if you click on the appropriate link. Do not forget to specify in the text of his address to support e-mail address, which you have lost. And write all the data that you used when registering the account: full name, date of birth, password (as you remember), your security question and answer (as you remember them) and stuff. Be patient – a possible answer from support "Rambler," you'll have to wait a few days. Be prepared also to answer a number of questions. For example, you may be asked to list the names of the folders in your mail box, your usual IP address and information about the provider, information about tied to the mailbox icq account, and more.